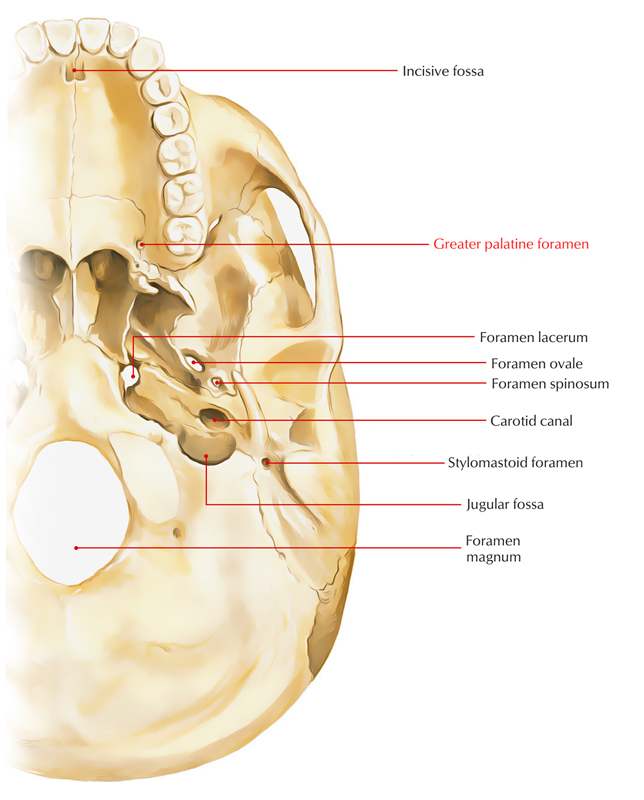 The greater palatine foramen refers to the hole which is created in the middle of the articulation of maxillary bone along with the greater palatine sulcus of palatine bone, inside the posterior hard palate of the greater palatine canal. Pterygopalatine canal is the other term for this canal. the lesser palatine canal is a small co contributing canal branches off it and travels further posteriorly. Towards the lesser palatine foramina, the foramen is located immediately anterior. It conveys the greater palatine nerve as well as vessels towards the palate. Within patients who have a modification of the nasal anatomy after trauma or malignancy that would prohibit use of the transnasal technique, the greater palatine foramen method for sphenopalatine ganglion block may prove to be helpful. Via the injecting local anesthetic on the ganglion, sphenopalatine ganglion block via the greater palatine foramen method is completed. The patient is placed in the supine position. Immediately medial towards the gum line of the third molar, the greater palatine foramen is known on the posterior part of the hard palate.